Before you go near a horse you should consider the impact a head injury would have, if not on YOU, then on your family. 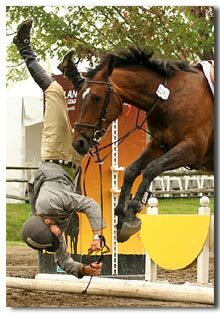 And remember that even the most experienced and best trained horse riders often suffer the unplanned dismount. The focus on how to prevent equestrian injuries is high. Equestrian activities have one of the highest risks of serious injury and death compared with other sports (including motorcycle and car racing). The vast majority of equestrian related injuries (approximately 80%) occur while riding. About 20% of injuries occur during horse handling activities (eg. driving, grooming, feeding, shoeing, leading) and unrelated activities, such as playing in the vicinity of a horse. Falls from a horse are the major cause of injury (up to 80%), followed by crushing injuries inflicted by the horse or horse kicks. The major cause of death and severe injury in horse riders is from head injury resulting from a fall from the horse. Many riders were not wearing a protective helmet, or had been wearing an inadequate helmet, or one which was dislodged from the head during the fall. Less severe injuries are predominantly bruises, cuts, abrasions (particularly to the face), fractures (mainly to the arm), and joint sprains. Injuries to children tend to be more severe than those to adults. Children and adolescents are the most commonly injured group, particularly young girls (10-19 years) due to their more frequent participation in equestrian events and activities. Horse related non-riding injuries are also a serious problem, particularly for children. The main injuries in children are to the head and face (skull fractures, concussion, cuts, bruises), and in adults are to the arm and fingers. The main types of equestrian injury when not riding will be the result of being kicked by the horse. Safety Tips – How to prevent equestrian injuries while riding and handling. A combination of common sense and caution are needed when dealing with horses. To avoid equestrian injuries a constant awareness of your horses strength, nature and behaviour are needed. Get to know your horse, respect it and be alert to things which may frighten or spook it. Selecting an appropriate horse is the first step. Choose a horse that matches you or your childs age, skill, experience and size, as well one which is suitable for the specific riding task. Select older horses for novice riders as they are quieter and more predictable. Try to consult or engage an experienced rider to help in selecting your horse, especially if its your first horse, its a worthwhile investment. Always handle horses with care and respect. 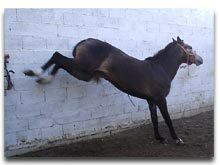 Always exercise caution around the hind legs of a horse; they are well designed for kicking those coming up, unseen, behind a horse. Handle all ropes and reins in a manner that avoids loops which could trap your fingers. Keep very young small children away from horses, especially other peoples horses. Children should never be allowed to play near or in the vicinity of horses.